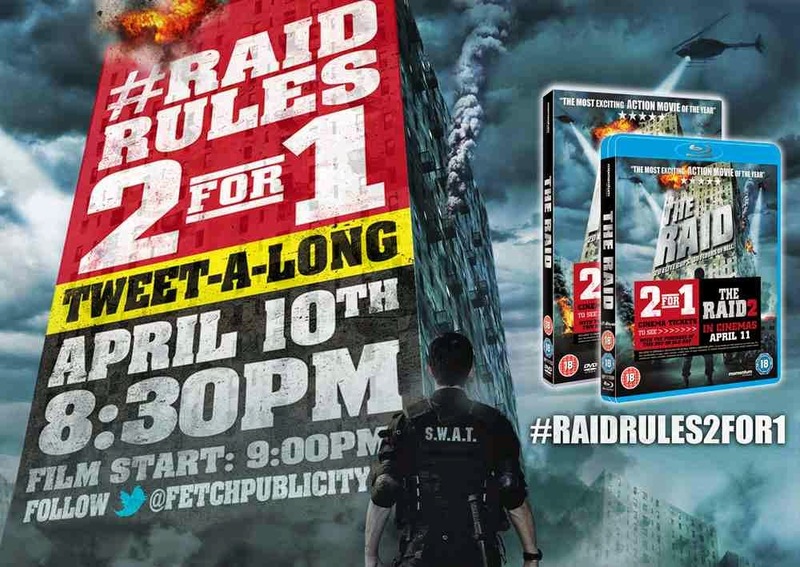 With the imminent arrival of the highly anticipated blockbuster The Raid 2, Fetch Publicity are pleased to present the #RaidRules2for1 Tweet-a-long. Get on board with this high octane action packed social media event to help us celebrate the break-out hit of 2012 and its forthcoming sequel. The #RaidRules2for1 Tweet-a-long will be taking place on April 10th. The fun kicks off from 8.30pm with the film to start at 9.00pm sharp. This is guaranteed to be a lot of fun (with prizes to be won! ), so we would love to have you there and anyone you wanna bring along for the ride! Just a reminder that The Raid is available now on DVD and Blu-ray in stores nationwide that includes a fantastic 2For1 Cineworld ticket offer for the The Raid 2, on promotional packs, whilst stock lasts.